Brilliantly located opposite a park and a stone’s throw to white sandy beaches, this 7 bedroom, 4 bath home has world-class quality fittings and finishes, a sparkling heated pool and sun-soaked alfresco zones. You’ll love every inch of the light-filled living zones which include a lounge with a cosy gas log fire, media and dining rooms. With soaring ceilings and oiled oak floors, there’s a sense of elegance and warmth that will make you feel at home. Step out to the central pool courtyard, which has several relaxed alfresco zones to suit your needs, whether you’re dining with friends or reading in the shady cabana. The heated salt pool laps at the timber deck to give that resort-style vibe. The gourmet kitchen is a perfect blend of traditional charm and contemporary convenience. 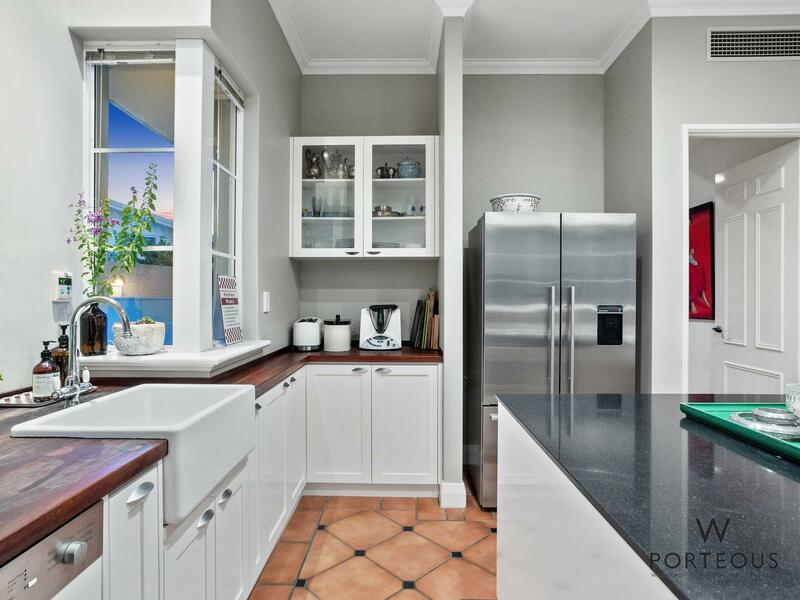 A gleaming stone island bench is matched with oiled timber benchtops, quality Neff oven and cooktop, integrated Miele dishwasher and a large walk in pantry. Upstairs, the magnificent main bedroom suite will take your breath away with its calm and tranquil ambience. Designed to be a retreat from today’s hectic lifestyle, the beautifully-lit bedroom is a dream come true. There’s a large fitted WIR and a generous dressing room which could be used as a private study or retreat. The stylish monochrome ensuite has twin vanities and a bath for when you need to finish the day with a long soak, bubbles and scented candles. Also in the front wing, there is a study, two spacious bedrooms with WIR, a family bathroom and powder room. The second wing of this unique home reveals the true treasure of this bespoke property. If you have an older or younger generation living together under the one roof, regular longterm houseguests, or just like to have enough space for everyone to have their independence, this is the answer. A bright and spacious open-plan living room opens out to enjoy pool views and has its own alfresco terrace. The gourmet kitchen has a long stone-topped island bench, breakfast bar for casual meals and quality Bosch appliances. Upstairs, there are two spacious bedrooms with WIR/BIR, a chic bathroom, and a study nook on the landing which opens to a private lawn, surrounded by easy care gardens. The house is masterfully designed and shares a basement activity/games room, wine cellar, gym/6th bed, utility areas, drying courtyard, storage, and a 5 car undercroft garage that can be securely accessed from either wing. This unique home is a masterpiece of luxurious design, with no expense spared to create a sophisticated yet welcoming family home. Inspection is a must!